In her powerful and inspiring memoir, Cookie Johnson, wife of NBA legend Earvin "Magic" Johnson, shares details of her marriage, motherhood, faith, and how an HIV diagnosis twenty-five years ago changed the course of their lives forever. On November 7, 1991, basketball icon Earvin "Magic" Johnson stunned the world with the news that he was HIV-positive. For the millions who watched, his announcement became a pivotal moment not only for the nation, but for his family and wife. Twenty-five years later, Cookie Johnson shares her story and the emotional journey that started on that day--from life as a pregnant and joyous newlywed to one filled with the fear that her husband would die, that she and her baby would be infected with the virus, and that their family would be shunned. 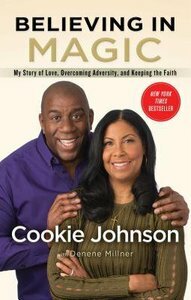 Believing in Magic is the story of Cookie's marriage to Earvin--nearly four decades of loving each other, losing their way, and eventually finding a path they never imagined. Never before has Cookie shared her full account of the reasons she stayed and her life with Earvin "Magic" Johnson. Believing in Magic is her very personal story of survival and triumph as a wife, mother, and faith-filled woman. About "Believing in Magic: My Story of Love, Overcoming Adversity, and Keeping the Faith"
Cookie Johnson is a devoted philanthropist, child advocate, and, as Secretary of the Board of Directors for the Magic Johnson Foundation, a passionate spokesperson whose focus is on addressing the health, social, and educational needs of underserved communities. She joins her husband, Earvin "Magic" Johnson, in the fight against HIV/AIDS by spreading the word on ways to help reduce new HIV infections in underserved communities, educating minority women about the disease, and providing helpful tools for prevention and testing. Cookie also is the founder of CJ by Cookie Johnson, a premium denim line. The Michigan State University graduate lives with her husband in California; she is the mother to their three children, André, Earvin Johnson III (EJ), and Elisa.